In just a few weeks, mining and exploration companies, investors and dignitaries from across the globe will brave the Toronto weather for the annual Prospectors and Developers Association of Canada (PDAC) conference, the world’s largest mining and exploration conference. The PDAC 2015 edition will feature a dizzying number of events packed into the first four days of March. From soil samples to soirées, there will most certainly be something for everyone. This year’s PDAC will also be an exciting one for the CSE. In addition to exhibiting at the Investor’s Exchange, the CSE will also be hosting an investor networking luncheon as well as signing on as a sponsor for the outreach organization Mining Matters. 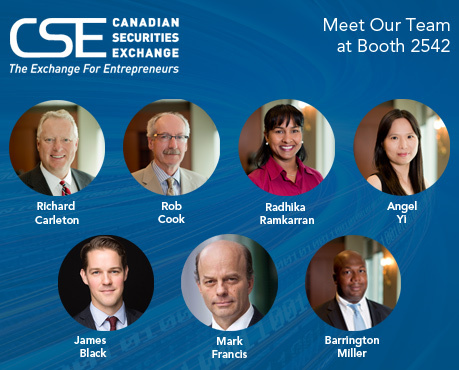 Individuals interested in connecting with representatives from the CSE can stop by booth 2542 at the Investor’s Exchange section each day of PDAC 2015. Along with the CSE, there will be several CSE-listed firms exhibiting including Regal Resources Inc. (RGR), Newlox Gold Ventures Corp. (LUX), Copper Reef Mining Corp. (CZC) and Western Uranium Corporation (WUC). In addition to exhibiting at the PDAC, the CSE in partnership with MNP LLP, Newsfile and Peterson & Company LLP, will be hosting a special investor luncheon on Tuesday March 3rd from 11:30am to 1pm. During the luncheon, attendees will hear from a number of CSE-listed firms and will also have the chance to network with and ask questions to CSE representatives. Last year’s luncheon was a tremendous success and filled up quickly. As space is limited be sure to register early here. Without question, the PDAC 2015 will showcase the great entrepreneurial spirit and resilience that characterizes the mining industry. The fact that they’re willing to brave Toronto in March is a testament to that. For more information on PDAC 2015 or to register, click the link here.